Ginny A. Roth, will speak at 2 PM ET today, April 6 in the NLM Lister Hill Auditorium on “A Call to Service: Women Represented in American Red Cross Posters and Postcards During World War I” as part of the Library’s World War I Centenary Forum. Circulating Now interviewed her about her work. Ginny A. Roth: I’m Collection Manager of the Prints & Photographs program in the Images and Archives section of the History of Medicine Division. I’m originally from Brooklyn, NY, and moved to the DC area in 2003. I pursued a Masters in Library Science the following year, and wanted to combine that with my interest in the visual arts. As Collection Manager, this position allows me the opportunity to do that. I work with a variety of formats in the collection, including posters, postcards, photographs, fine art, slides, and ephemeral items such as advertisements and public health comic books. I’m not sure I have a “typical” work day because I’m not usually sure which part of the collection, or which items, I’ll need to access. However, I routinely catalog and digitize physical items that will be imported into the Division’s image database, Images from the History of Medicine, in NLM Digital Collections. I also manage accessions (items being added to the collection), write blog posts about collection items, work with the Exhibition Program to give them access to items for display, and manage the housing of the physical collection. CN: This week, on the centenary of the U.S. Entry in to World War I, you’ll be giving a presentation titled “A Call to Service: Women Represented in American Red Cross Posters and Postcards During World War I“ Tell us a little about it. GR: The items I’ll be discussing are American Red Cross propaganda posters created during World War I (1914–1918). The majority are recruitment posters targeted to women who, through dramatic imagery of women on the battlefield caring for wounded soldiers, are “encouraged” to do their patriotic duty and join the war effort as volunteers. Other posters are aimed at all Americans to contribute monetarily to the war through the purchase of Liberty Bonds or contributions to War Funds. CN: What can these items tell us about the history of medicine in WWI? GR: One of the most prominent conclusions is how all classes of women were, in an unprecedented way, targeted through advertising to step out of their traditional domestic roles and take on job opportunities typically occupied by men. Women were called upon to provide medical relief on actual battlefields where their lives were in as much danger as a fighting soldier. They were also trained as ambulance drivers and worked in munition factories, among other jobs. 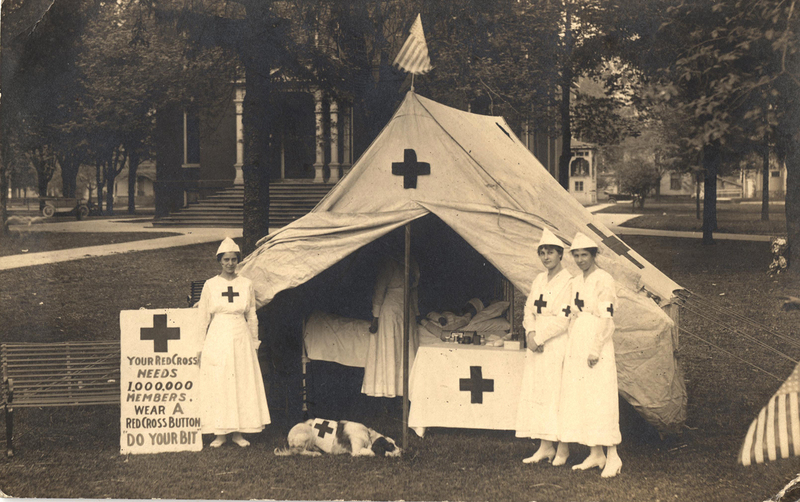 Thousands of women in the United States joined the Red Cross to dedicate themselves to supporting and expanding the war effort, which in turn not only gave them a chance to prove their capabilities, but gave them a chance to show their patriotism. CN: Today’s digital communication is very different from 100 years ago, how did people use posters and postcards during the war? Was it very different from peace time? GR: Public health campaigns have long involved a variety of media to help communicate their objectives. During war time, the use of images and text together made for effective propaganda that could be broadly disseminated to the public to “convince” them to take action. The Red Cross used an effective poster campaign to inspire citizens to participate in the war, either through service, work, or financial means. Red Cross recruitment posters were very common, as were appeals for monetary donations and volunteers. Visually striking illustrations of wounded soldiers on the battlefield combined with patriotic messages, national symbolism, such as the American flag, and even religious overtones were ubiquitous and posters were mass produced beginning in 1917. Illustrators were solicited to create these images, generally dramatizing scenes that would elicit emotional responses from the public and thus encourage them to contribute to the war effort in any number of ways. CN: At this hundred-year mark, and especially this week, the Great War is being discussed on all hands, how do you see the role of Libraries during this time? GR: Since Libraries house the documents that educate us about historical events, there is much to be learned in these institutions about World War I, and the circumstances that surround America’s entry into the war. Letters sent home from soldiers, photographs of hospitals and the wounded, print materials with messages that encouraged the public to take part in the war effort, etc., are all links that let us piece together the events that took place during the war; libraries and archives tell us the stories of those who experienced and remembered the Great War and are no longer here to speak to us. The World War I Centenary Forum presentation is part of our ongoing history of medicine lecture series, which promotes awareness and use of the National Library of Medicine and other historical collections for research, education, and public service in biomedicine, the social sciences, and the humanities. All lectures are live-streamed globally, and subsequently archived, by NIH VideoCasting. Stay informed on Twitter about the centenary at #WW1 and the lecture series at #NLMHistTalk. I saw the first part of this live program earlier, but then had obligations elsewhere. Will this be available later on YouTube, and if so, when? Yes! But not on YouTube. NIH Videocast archives the lectures usually within 2-3 days. I hope you will enjoy the end of the program! Why in Video Cast Should I register first? You do not need to register to watch the video. Lectures are also available through NIH Videocast by Podcast and RSS.